In the 1940s and ’50s dichlorodiphenyltrichloroethane, a synthetic pesticide better known as DDT, was used to kill bugs that spread malaria and typhus in several parts of the world. 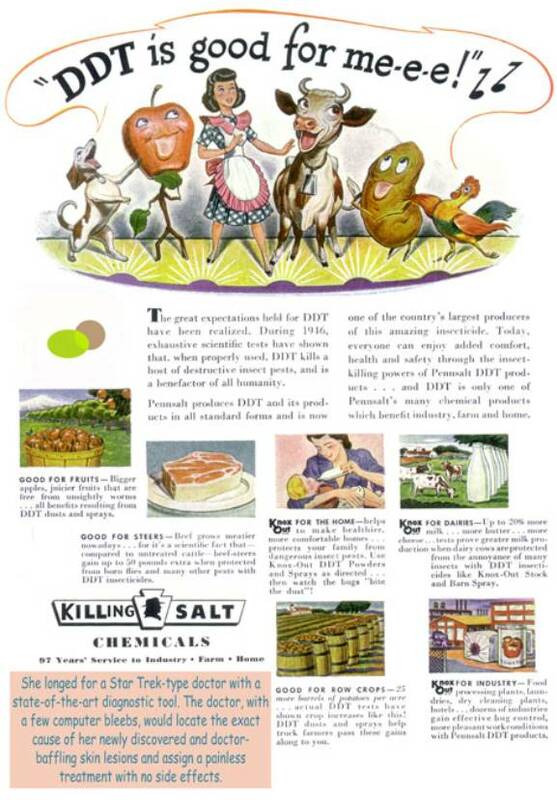 DDT was argued to be toxic to humans and the environment in the famous environmental opus, Silent Spring. It was banned by the U.S. government in 1972. FOR INDUSTRY – Food processing plants, laundries, dry cleaning plants, hotels . . . dozens of industries gain effective bug control, more pleasant work conditions with Pennsalt DDT products. Perhaps DDT used in the average household is not a great idea, but what about all the people dying of malaria because DDT has been banned? Indeed, DDT is still approved by the WHO for indoor residual spraying, which has far less potential for environmemntal harm than agricultural spraying - and that requires orders of magnitude more DDT. @Alexandra @ Julian...so keep using DDT because its not a good idea in homes but its ok outside the home? We shouldn't ban it because people die from malaria? It has far less potential for environemntal harm than agricultural spraying? I have an idea, just stop using it and find other healthier solutions, look at other possibilities. Meanwhile the bee populations throughout the world plumets to all time lows that never seen before. Chemicals/insecticides are having a disasterous effect on our support systems. The sooner we live with the natural world intead of agaisnt it and trying to control everything the better off we may be. In regard to "We later discovered it to be a horrible environmental toxin," well not quite. It was found to cause thinning of egg shells in some wild birds, particularly predators. It has saved, and continues to save, many lives. These "sociological images" are useful and interesting, but the propagandistic and uninformed tone of many of the introductory comments is unnecessary and unhelpful. Frankly, two PhDs should know better. DDT is not particularly dangerous to humans. It is less dangerous than many of the pesticides that have replaced it. The environmental problems with DDT are also exaggerated. The problem is not the chemical itself, but the way it was used with indiscriminate spraying and widespread agricultural use causing toxic runoff that killed fish and birds. 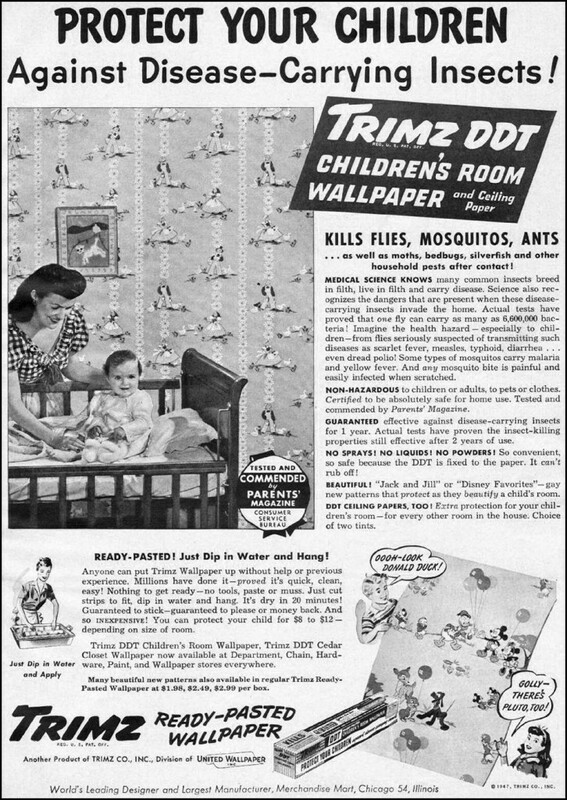 Using DDT laced wallpaper to protect against bedbugs or against mosquitos carrying malaria would have a minimal environmental impact but have major benefits. Many chemicals can be dangerous, and usually that means that the chemicals are regulated and there are strict guidelines for their use. It's a shame that the polemic surrounding this one has caused it to be banned outright. Allow me to jump on the Science bandwagon here. As many have mentioned, DDT is not actually harmful to humans. Malaria, on the other hand, is quite harmful. While the ads are quite amusing, they are not actually wrong. 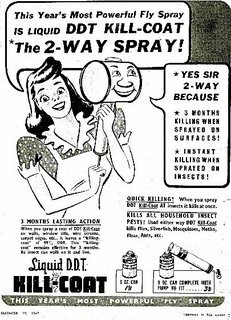 DDT did have most of those positive effects. Don't get me wrong, when overused and use indiscriminately, DDT can certainly have bad effects on the ecosystem. When used properly, the effects on the environment can be minimal while drastically improving the lives of the human poppulation. As point of fact, those most positively affected are the impoverished in 3rd world nations. I think the more interesting sociological question is how good science was overcome by hysteria about the effects of "chemicals". I have to agree with the previous commenters. I love the blog but this post seems awfully short-sighted. You've made a good habit of pointing out that issues like these aren't as black and white as they may seem in the past, but I feel that sentiment has been lost here. DDT may not be perfect, but this post is frankly unfair. DDT is not very harmful to mammals. Modern insecticides one can buy at the grocery store are much more dangerous. My grandfather used to be the locust-control man and traveled around (then British controlled) Kenya to that end. He used to eat a chunk of DDT, like it was fudge, to show that it was harmless. This is maybe, maybe not, responsible for the kidney problems he had about forty years later. If you ate Malathion in such quantities, you'd be poisoned and probably die in short order, and malathion is considered one of the more human-safe insecticides, is commonly used in the US and heck, they put it on children's heads to kill lice. The thing about DDT is that it does not break down in any reasonable time frame. So it is a horrible environmental toxin when you use it as a crop spray. You're just putting more and more of it out there, it washes off in the rain but it doesn't decompose into something else, it merely gets moved. As locust control, it's a bad idea. Mosquito control items, like the wallpaper, or a DDT impregnated window screen, or, say, if the binding tape on the edges of your mattress were impregnated with DDT to kill bedbugs, those are probably a very good idea. To properly use it, it should be put places where one actually wants it to last, and where it won't get moved. I know quite a number of people who used to run in the DDT spray off the crop-dusters. 1. DDT, when used as a crop pesticide, accumulates in the environment for devastating effects on wildlife, especially predatory birds but also other species. It then does not go away for a long time. 2. Modern animal testing has shown that DDT, in the quantities that were normally in the environment after crop spraying, DOES have significant effects on mammals. These effects include miscarriages, male infertility, prematurity, neurological abnormalities in young, diabetes and breast cancer. Were DDT to be introduced as a new product today, it would never be approved as a crop pesticide based on this evidence. 3. We don't know if those children running behind the trucks wound up with any health effects. Pretty much everyone in this country has health problems and it's hard to tease out causes or contributing factors. However, the risk to other mammals implies it's probably not a good thing to spray indiscriminately. 4. There is not and has never been a ban against the use of DDT as a vector control means. DDT is widely used in malaria countries to control the disease, even now. 5. At this point, because it was used on crops, most mosquitoes are resistant to DDT anyway. It's potency is fading fast so it is being phased out. 6. Modern resistance to DDT as vector control comes primarily from locals who use it, who object to the smell, the residues on the wall, and the fact that DDT does not kill, and in fact agitates, many other insects. DDT spraying causes things like bedbugs and cockroaches to be more active and thus do more damage. There is no conspiracy to keep DDT down. It is an unpleasant chemical which had some usefulness in disease control, was used inappropriately to disastrous effects, and at this point is causing more harm than good, especially since there are other pesticides availiable that are more effective and safer when used appropriately. The bans and restrictions on DDT have been devastating to developing nations, many of which saw deaths from malaria jump from single digits to thousands within a year or two of the restrictions. Millions of people have since died of malaria in places where the disease had been nearly eradicated thanks to DDT. All because rich developed nations decided that they shouldn't be allowed to use it (while being able to afford other pesticides themselves). People who claim to advocate for the poor, the vulnerable, the underprivileged should be ashamed of this. But instead they celebrate it. A couple of comments. One I grew up with DDT on a farm. We used it to spray our milk cows during milking. Used a sprayer much like the ones in your ads. We milked our cows by hand and had to lean against them well we milked. Lots of flies around the barn as yo u might imagine. The second comment is to my knowledge many third world countries have yet to ban DDT. The trouble is we don't know what health problems those kids have today. Chances are they all have tons of health problems, but what percent of their infertility and miscarraiges was that vs. other factors? How much incidence of breast cancer was caused by that vs. other factors?. Now of course they show kids running around being sprayed by that...I wouldnt want to be sprayed with gas from fluorescent bulbs either. But buying a bulb, using it PROPERLY, yeah..sorry that's just fine. DDT affects the endocrine system (which is extremely important, especially during development). The EPA is not the only health agency that states this chemical is unsafe. Look into the WHO (world health organization) report for starters. Some (few) countries still use DDT to kill malaria carrying mosquitos but only after a cost benefit analysis determines the risks of using the chemical are outweighed by the benefits. As for scientific evidence, there is quite a bit of literature on this specific compound. Furthermore, Silent Spring is not the only book proposing such chemicals are having deleterious effects on the environment (read "Our Stolen Future" or "Hormonal Chaos" and others written by scientists who have read and understand the scientific literature). We are facing a number of health issues across the globe, many of which involve chemicals affecting the endocrine system. In fact, there is an entire field of scientists that address such issues (endocrine disruption). The problem with determining cause and effect relationships is that WE CANNOT DOSE AND THEN STUDY HUMAN SUBJECTS. Instead, we must study other organisms and infer the costs to humans based on what happens to the organisms studied. IF YOU REALLY THINK THIS CHEMICAL (OR OTHERS) DO NOT CAUSE PROBLEMS IN HUMANS, THEN VOLUNTEER TO BE A TEST SUBJECT. If you are not willing to do that, ask yourself why. Most likely, you will find that you are not willing to take the risk...what does that tell you? 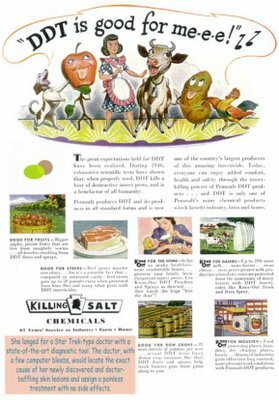 DDT saved thousands of lives World Wide! America is now being infested with the bed bugs and mites that DDT saved us from. Only a matter of time before your home is infested with bed bugs. These bugs won't descriminate your going to see how it feels to live in a third world country right here in the good old U.S.! YOUR GOING TO BE A MISERABLE PEOPLE! Insecticides being sold in the U.S. now are worthless and won't kill bed bugs or mites. No humans have been harmed in any way by DDT! People in the 40's and 50's even ate DDT by the spoon fulls as a suplement. Most of whom lived well into their 80's and 90's! My Grandfather was soaked with DDT every day for years spraying his crops. My Grandfather never even got a cold he lived into his 90's before he died. If bed bugs get in my home I'll make my own DDT it's not that hard to make. If you need it make your own! This is an add from the 1950's! This is not a current add. Did you think it was?? Ha ha ha !!! who hoo! What a bunch of BS. 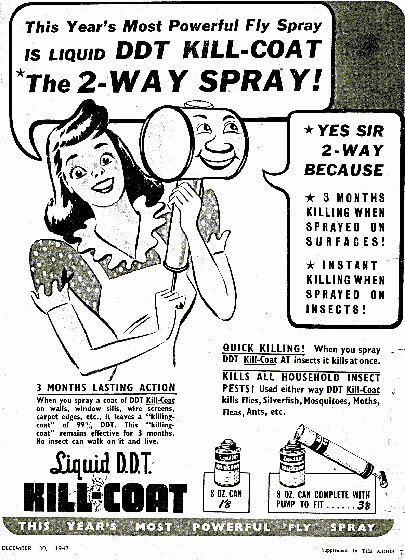 DDT was as safe as baby formula. It was banned by leftists who are eugenics nazis to curb population growth. Read the truth for yourselves and learn something instead of believing propaganda from the rogue EPA and elitists. The clip is not from a documentary, it's from the 2011 film "The Tree of Life" (Brad Pitt, Sean Penn). Bring back DDT screw the dam commie liberals they want death and destruction not healthy clean environment. They want cheap pesticides that don't work time to clean house in our government federal and local their Oath of offices get them on treason! that don't work BS.Time to clean federal government up and local it takes a few good lawful men to get them on their oath of office for treason cause there not up holding it .